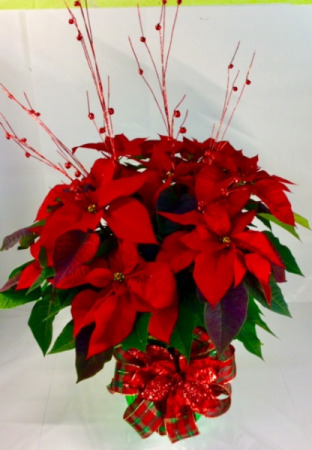 This bright red poinsettia plant potted in a 10" pot is a classic Christmas gift. It has a beautiful wide bow with shiny red trim and we've upped the game by decorating it with fun "jingling" branches! 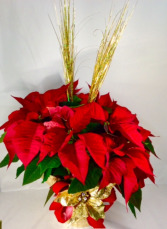 Celebrate Christmas with this traditional centerpiece filled with fresh winter greens, carnations, Fuji mums, cushion mums, plaid bows and gold glass balls. Christmas is right around the corner! 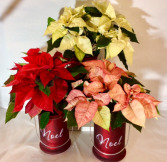 Send this dazzling bright red poinsettia plant potted in an 8" pot and decorated with super shiny and bright gold trim.